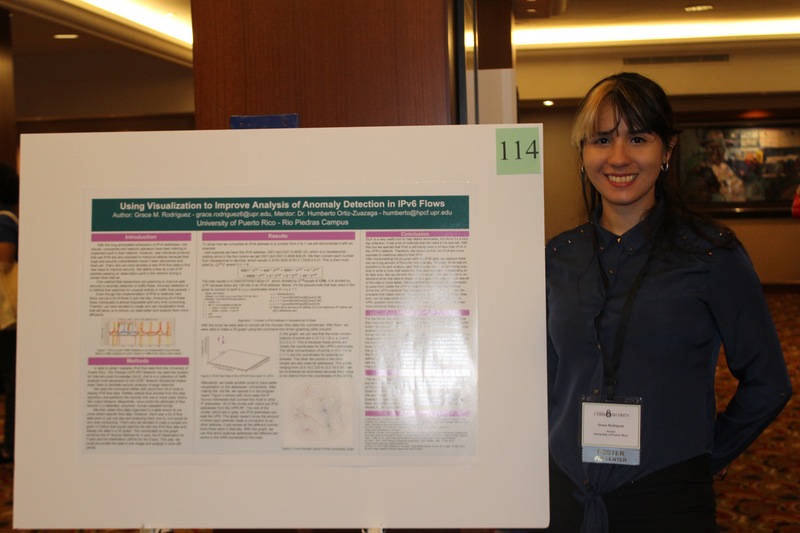 Bianca Colón and Grace Rodriguez, scholars of the Scholarship for Excellence in Cybersecurity, participated in the 3rd Women in Cybersecurity conference 2016 hosted in Dallas Texas from March 31 to April 2, 2016. Both students presented their work with Dr. Humberto Ortiz in network security. It is the second time that Bianca Colón participates in this conference which last year was hosted in Atlanta. Bianca Colón at the WiCyS 2016 conference. Grace Rodríguez at the WiCyS 2016 conference. Grace and Bianca at the WiCyS 2016 conference. Being able to participate in the Conference of Women in Cybersecurity (WiCyS) was an amazing experience. I was able to meet a lot of people that works in the cyber security field, and participating in the poster session was much better because I was able to receive feedback from cyber security professionals about my undergraduate research. Thanks to WiCyS, I had the opportunity to be interviewed with IBM for a summer internship and received more invitations for future academic and non-academic internships. I decided to accept the IBM offer for summer 2016. I'll be looking forward for an academic internship in summer 2017! I was very grateful that I was given the opportunity to attend the Conference for Women in Cybersecurity (WiCyS) 2016 for the first time. I was able to present my poster and got a lot of good feedback in my research which helps me boost up confidence. I also got constructive criticism and some advice which can help me improve the implementations in my research. I also was able to do networking with experts in the field of cybersecurity and computer science and got some mentorship from them. I found that very helpful because they gave me advise about career and academic choices for my future.